Early in 2015, off the back of my appearance at the Loud Tate: Code event, Rosemary Kirton interviewed me for an online magazine. Sadly that magazine is no longer online and the interview was never published. With her permission I’m posting it below. Some of what is said is now irrelevant or old, but it was such a great interview that I just had to share it. 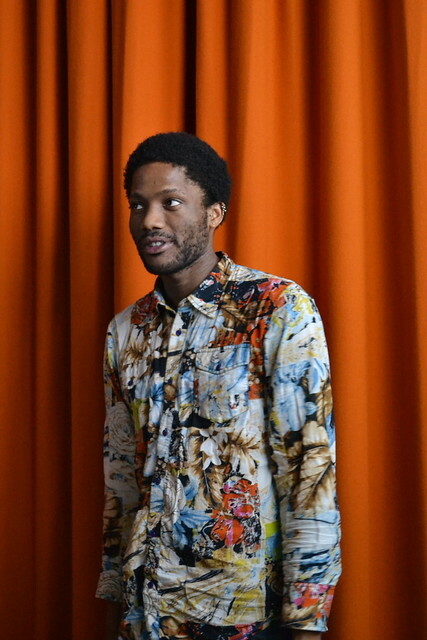 Antonio Roberts, currently based in Birmingham, UK, talks to [redacted] about his work as a Glitch artist, and how meaningful it is to him and for our digital posterity, to share this knowledge with the public. “Code literacy is likely to benefit us through a better understanding of how computers are intentionally produced to use us, and a digitally literate public can work to fight this. I was really pleased to see you got your Art Residency at University of Birmingham, UK back in July, how is that going? It started off a bit slow at first but has been picking up speed now that the academic year is in full swing. My residency proposal was to do research into copyright and how that affects the use, reuse and remixing of the cultural archives and collections at the University of Birmingham (five collections in total). This topic is definitely tailored towards research, and as such I haven’t actually produced much tangible artwork. Much of my time has been spent doing reading around the subject. What’ve you been reading then? Writers, artists and activists including Aymeric Mansoux, Rob Myers, Ronan Deazley, Richard Clay, Aaron Swartz and Nina Paley have been influencing a lot of my work. What other plans do you have beyond this research? In an ideal world I would convince the University of Birmingham to relicense their archives and collections under more liberal licences. I already know that this process isn’t so simple – especially when there can be so many rights owners involved in a single artifact – so I intend on making work which engages with these limitations and attempts to work around them, all the while highlighting the ridiculousness of current copyright law. I picked up on you challenging/exploring limits of copyright not long ago with a series of GIFs that explored these themes. Care to give a little insight into how Copyright Atrophy came about? Copyright Atrophy, which formally launched in 2014, has its roots in a piece I made in 2011. What Revolution? used glitch art – more specifically vector glitches – to highlight the change in meaning of a logo or symbol through reappropriation, reuse, overuse and remixing. From that I started playing around with a processing sketch to decimate SVGs (vector files), and then used this sketch to decimate the Arts Council logo in response to a round of funding cuts that they had made. Due to the lengthy process of manually downloading all the files, I put the project on hold, in order to release Comic Sans Must Die, after which I eventually came back to Copyright Atrophy. Similarly to What Revolution? I wanted to challenge copyright and explore how far a piece/artwork/symbol must deviate from its original before it loses all associations from its original. Or, to put it another way, how far can I got before I get sued! You’ve been travelling around the world to work, present at or organize festivals and events. Is there anything you use to occupy yourself on these journeys? Despite the traumatic flights, where did you go and what did you get up to 🙂 ? I’ve taken far too many flights this year. In March I was invited to Stony Brook University in New York to give a lecture about glitch art for their f(Glitch) event and also curate a Bring Your Own Beamer event. Towards the end of March I was back in the States for a social visit. I had gotten into the habit of seeing my glitch buddies at least once a year for GLI.TC/H, and so when that festival didn’t happen in 2013 I felt a bit sad, so I went to Chicago for a few days. This was followed by a few days in New York City and then a suprise visit to Miami due to a delayed connection. In September I was back in Chicago to take part in glitChicago, an exhibition about the Chicago glitch scene curated by Paul Hertz. I still find it incredible to think that I’m part of the scene there despite living over 5000 miles away. I also regularly go to Brussels to either work with or take part in activities organised by Constant/OSP. It’s much less traumatic travelling there as it’s just a two-hour train ride on the Eurostar. I don’t really travel for reasons other than to work. I’m a workaholic and love teaching so will take any opportunity to work, perform at an event or teach at an institution, much to the chagrin of partners or buddies that may be travelling with me. What apps/programs do you use most often for your work? I focus on being productive so rarely have time to sample and play around with new toys/programs unless I intend on heavily investing in them. I like that sense of commitment! WhatsApp has similar privacy issues and I hate using yet another messaging service that isn’t based on published standards. SMS and e-mail will live long past the latest app fads. I completely understand the concept behind Snapchat, but I’m an archivist by nature, and so I would often find myself wanting to post the same content to Snapchat and other services such as Instagram and Tumblr, which aren’t as ephemeral. I never signed up for Ello, Emojli, Yo, or many of the “new” social networking sites. I have nothing against what they are set out to achieve, I just have no reason to do the same thing – posting funny cat pictures – but on a different site. I was thinking about how people were and perhaps continue to debate the term ‘glitch,’ or ‘glitch art’. How do you feel about the term and your work? Every so often I see an article or blog post declaring the death of glitch art due to apps making it easy to produce and it being overused. I really don’t care for that argument. There is the argument that these apps and push-button processes only allow engagement with glitch art on a superficial level, but anything that widens access to glitch art can only be a good thing. Also, out of the thousands that download these apps and engage on a purely aesthetic level occasionally there are a few that really start to delve into glitch art and help to contribute to it on a critical level. Part of the reason for my attitude is because there is more to glitch than just a visual aesthetic. It’s a very open concept that can include anything that incorporates randomness, chance, use and appropriation of mistakes, destruction and many other similar concepts. 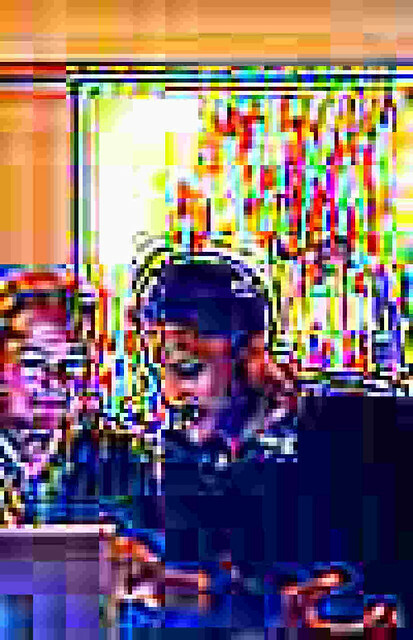 Whenever I’m presenting or teaching people about glitch art I always try to include Translation Party and the Caption Fail videos by Rhett and Link as examples of how concepts surrounding glitch art – computational error, misuse of software etc – can manifest themselves in ways other than just datamoshing or jpg glitches. Yeh in the spirit of the ‘death of painting’ it makes sense that glitch art would have a more accelerated cycle of apparent death! I often document glitches, or behaviours in programs/ services I use and cannot comprehend… Do you do this too? I used to do this in my early days of glitch art. My What is your Glitch? videos were a response to the Vernacuar of File Formats by Rosa Menkman and a way for me to document the glitch aesthetics I was discovering. 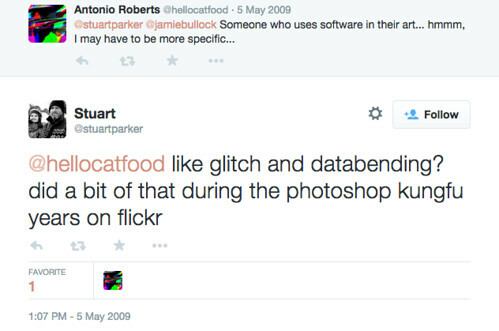 At the first GLI.TC/H in 2010 myself and Jeff Donaldson/noteNdo started the Glitch Safari project, which was a way to collate glitches found on public displays. Aside from that, glitches usually happen too quickly for me to capture them. Are there any particular processes in the wide remit that might result in glitched visuals that are your favourite to use? I absolutely love feedback loops. This is where you feed the output of your visuals back in on itself. Similar to what happens when you put a mirror in front of another mirror. It creates a water-like flow of colour which I really like and works very well for live performances. I used this recently for the visuals I did for My Panda Shall Fly at Fierce Festival. As for file formats I really love SGI file format glitches. Sometimes it results in red, green and blue rectangles that are far removed from the original image, but at other times it can create amazing grid-like patterns. How did you discover this kind of practice- glitching and testing the limits of programs- were there any milestones or inspirations that spurred your interest? 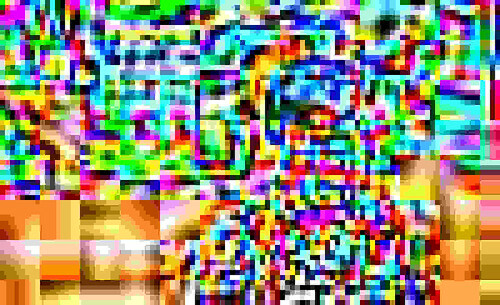 Prior to that I had made some accidental glitch art when my camera malfunctioned. I tried, without success to recreate that in Photoshop. The other major milestone was attending the 2010 GLI.TC/H event. 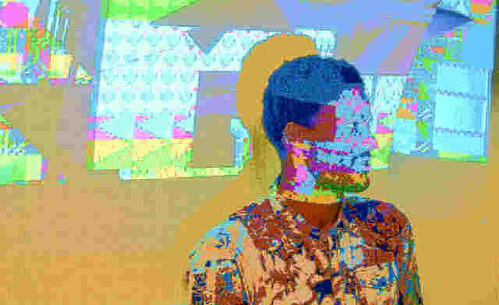 Even though I had only been creating glitch art for a little over a year, the community was very welcoming and demonstrated the many ways to work with – and against – computers. I know it’s cheesy, but the community was and still is a great inspiration to me. Whom or what takes your interest currently, like peers or projects? A big part of my practice is about free culture and sharing knowledge. Since 2008 all of my work has been made using open source software and shortly after that using Linux as my default OS. To that end, I’ve always respected those that use open source software. One such group that inspires me is Constant/OSP, who are a design group based primarily in Brussels. They exclusively use open source software and experimental practices to produce work that is indistinguishable from art made with “Professional” software. I’ve had the pleasure of working with them on several occasions and they’ve taught me a lot about reclaiming my tools and building my own to produce artwork. I noticed you ran a workshop where you were making these things accessible- teaching people how to make a glitch cat, a glitched logo- in September. What did you want your students to get out of that experience? I wanted to show them that “hey, you can do this as well”. I wanted to demystify the glitch art practices and show that you don’t need to rely on pre-built software – like the plethora of apps out there. 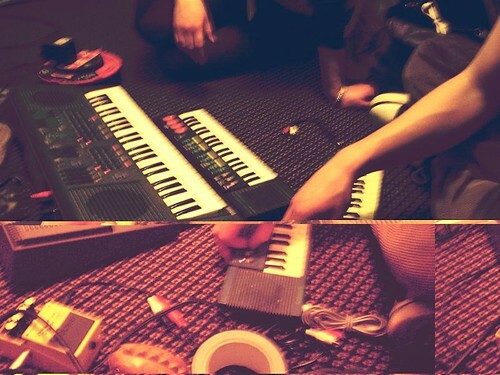 Part of the workshop that wasn’t documented was me trying to expand glitch art past being just a visual aesthetic e.g. how can some of the concepts surrounding glitch art – randomness, exploiting errors in programs, misuse of programs etc – be used in other practices. An example of this which I often point to is Variations on a Theme by Casey & Finch by Erik Bunger (2002 – 2011), in which the Bunger chopped and rearranged Casey and the Sunshine Band’s 1975 hit That’s the Way (I Like It) to sound like a skipping CD, which was then performed by a live band. I absolutely loved how it takes the aesthetics of a skipping CD – something which was a common frustration to many people – and appropriates it for something that is really entertaining! Do you think everyone should learn to code? Think of it this way: You don’t need to know how to cook in order to eat at a restaurant, but if you want something that isn’t on the menu then it sure helps. Given the theme of these interviews, which address ‘User Style’ I find the idea of learning to code interesting because it blurs the binary relationship between user and service. To extend and mangle your analogy, lol sorry 😛 learning to code provides the digital consumer/consumed with a better understanding of the structures that they inhabit/use and the means to change them, perhaps…? Yes, definitely! On one level knowing how something is made lets you fix and modify it. On another level you can begin to understand how it is operating and – potentially – using you. Learning to code seems like it has a DIY vibe but really it still engenders a reliance on a great many structures, systems and collaborators beyond immediate cognition. While it may provide a user/individual with a level of independence at first, how do you think a coding-informed public will impact the digital/environment in years to come? I hope that a digitally literate public will they begin to dictate the direction that their lives and surrounding environment takes. It’s often said that knowledge is power and now, more than ever, it couldn’t be more true. The amount of information flying around us, and the power that it possesses, has been highlighted in many high profile and occasionally unfortunate events. Chelsea Manning, Aaron Swartz, Julian Assange/Wikileaks and many others have fought to make us more digitally literate at their own expense. Code literacy is likely to benefit us through a better understanding of how computers are intentionally produced to use us and a digitally literate public can work to fight this.